Sinnerns lakes have excellent water quality. 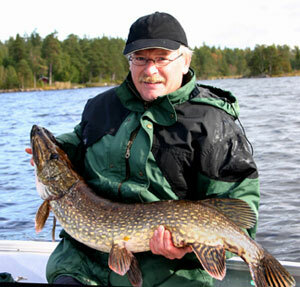 There are big pikes, plenty of perch and in- planted pike-perch. The largest lake in Sinnern is 570 acres with an average depth of 10 meters. The smallest is 280 acres with an average depth of 3 meters. Lake beds are mainly pebbles and gravel. Spinning and trolling are the best methods of fishing but float fishing gives good results. Five aluminium boats with sonar and 4 horse power engines are available for rental. Fishing licenses are necessary, these can be bought from the landlord. Although you may keep fish for your own consumption during your stay, the catch and release principal is used. The forests are an important part of our landscape, our history and our economy. In short, the forest is a part of our identity and our souls. We feel that we can get energy out of the harmony and peacefulness that the forest gives us. The clear air, the beautiful views and exiting meetings with the animals – everything contributes. We know that many of our guests appreciate the walks and bicycle rides to strengthen their condition and load their batteries. If you are lucky you might see an elk, roe deer, or hare. Sometimes you might get a glint of a badger or a fox. Many kinds of birds thrive in our forests. There are capercaillie, black grouse, woodpeckers and many other small birds. On the largest Sinnern lake there are both osprey and Black-throated diver, a confirmation that the lakes have the character of a wilderness. The area around the lakes is a Nature 2000 reserve (EU-reserve) which only goes to show that the geographical area has an interesting environment with a rich plant- and wildlife. 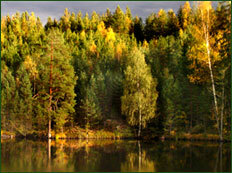 The forests vary between pine and leaf, (coniferous, and deciduous). They are easily available with many good roads for both walks and bicycle riding. Roads are suitable for both long and short excursions, and cycles can be rented. In the forests there are many places of historical culture. If you wish, we are readily available for guided tours. The area around the lakes of Sinnern goes back a long way. During the middle ages myrmalm (mire ore) was taken from the Largest Sinnern lake and melted on the hill to produce charcoal, where the Kolarhytten lies today. There is a stone hut from the middle ages. 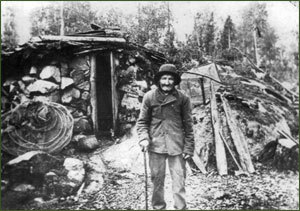 The last person to live there was Nisse Pell. He lived on fishing and hunting. They say that he recognised the large pikes that lived in the bays. Once he met two very proud boys carrying an enormous pike between themselves. Nisse was upset ”Have you taken that pike! I was saving it for the lady at Berga gård.” He used to exchange the pikes with the farms in return for pork, milk and sometimes alcohol as a thank you. 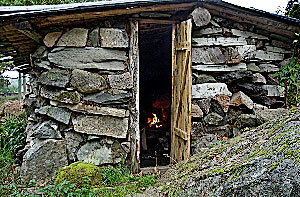 Nisse Pells hut was restored to its original condition 2005. In the forest around our cottages are several other places that witnessed how the grounds were used, for example crofts, stone cellars.